How to use emotion to attract, resonate with, and encourage your audience to act. 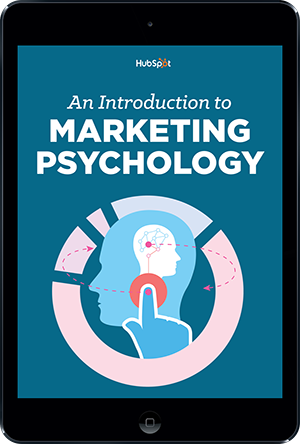 Learn psychology principles that can be applied to your marketing. What does it mean to do something “like a girl”? This is the question Always asks in its empowering 2014 #LikeAGirl campaign, which sought to exploit and forever bury the term “...like a girl”. Turning an insult into a bold movement of confidence not only brought revenue and popularity to the Always brand, but the 2014 campaign also won an Emmy, a Cannes Grand Prix award, and the Grand Clio award — a recognition practically unheard of in the advertising world. This is only a glimpse of how effective emotional marketing can be — for both brands and consumers. Today’s consumer base is better educated and better equipped to research what they don’t already know. They’re also flooded with advertisements on a daily basis. Here’s how: By tapping into another major component of the consumer’s attention span and purchase decision — emotion. In this guide, we’ll explain what makes emotional marketing so powerful and how you can leverage it to connect with your audience and encourage them to act. Emotional marketing refers to marketing and advertising efforts that primarily use emotion to make your audience notice, remember, share, and buy. Emotional marketing typically taps into a singular emotion, like happiness, sadness, anger, or fear, to elicit a consumer response. Before diving into why emotional marketing is effective and how to incorporate it into your marketing efforts, let’s first talk about emotions. Take a moment and think about what emotion you’re feeling right now. Remember, emotions aren’t exactly how your body is feeling. They’re more descriptive of your state of mind. Right now, it’s 8:30 a.m. as I write this. I’m tempted to say my emotion is tired … but tiredness isn’t quite an emotion. Instead, I’ll say I’m slightly annoyed because I’m tired, but I’m also excited because I have a great day ahead of me. Also, did you notice how my chosen emotions didn’t precisely fall into the four basic emotions of happy, sad, afraid/surprised, and angry/disgusted? Annoyed could be grouped under angry, and excited could be considered happy … but their definitions aren’t quite the same. That’s because emotions are like colors. There are a few defined concepts, but for the most part, emotions exist on a spectrum. One tiny change on the spectrum can lead to a different kind of happy, a different kind of sad, and a different kind of angry … kind of like the color green has infinite shades. 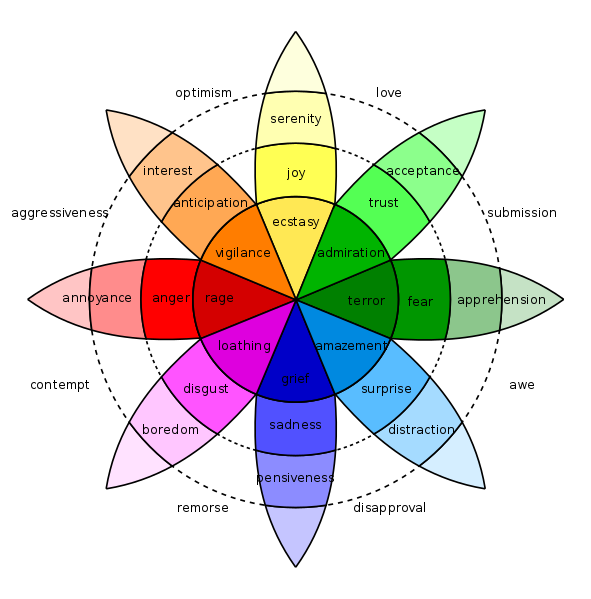 Robert Plutchik’s “wheel of emotions” illustrates some of these emotional spectrums — using colors, no less. I’ve taken a second to explain emotions because it matters exactly what emotion you include in your marketing. Depending on your product, industry, and audience, you can’t always target general “happiness.” Like with your marketing goals, you must dig deep and define precisely what feeling you’re aiming to elicit. This will influence the details of your marketing — your copywriting, media, graphics choices, etc. — and help it be as effective as possible. People feel. As much as we wish we didn’t, say after a heartbreak or during a scary movie, we can’t help but experience emotions. It’s in our nature. This is one of the reasons emotional marketing just works. Here are a few others. According to you, what makes for a great first impression? When you meet someone new, what stands out? Now consider a new business. If it were between two advertisements — one that simply talked about products, and one that made you laugh or cry — which would “impress” you? The second one, right? First impressions form in a matter of seconds. The same goes for a first impression of a product or brand, and marketing emotion can help shape that impression … and help that brand or product stand out in your mind. Think back to your last major purchase. Sure, you compared prices and spent time reading about each product, but when it came time to make a decision, I’m betting you relied on your heart over your head. I’m guessing that an emotion you felt, or wanted to feel, helped nudge you in the right direction. Dove’s marketing is a great example of this. Their inclusive, down-to-earth commercials focus on ensuring every woman feels beautiful, making their product seem like a source of many emotions — acceptance, serenity, optimism, self-love. Studies show that people rely on emotions, rather than information, to make decisions. Emotional responses to marketing actually influence a person’s intent and decision to buy more than the content of an ad or marketing material. Out of 1,400 successful advertising campaigns, those with purely emotional content performed about twice as well (31% vs. 16%) as those with only rational content. Emotional marketing helps people decide with their hearts, which actually has more influence on buying than their minds. While emotional marketing is a powerful tool for eliciting a purchase or two, emotions also encourage other activity that can help grow your business and brand. Sadness makes us empathize and connect … and empathy leads to increased giving. A 2007 study revealed that feelings of empathy lead to altruism and the motivation to act on behalf of others. It’s no surprise that organizations like the ASPCA feature sad photos and a moving song while asking for donations. Feelings of sadness inspire us to act and help people, which typically manifests in fiscal giving. Surprise and fear make us cling to what’s comfortable … and embracing what’s comfortable leads to increased brand loyalty. Marketers are typically afraid to leverage fear in their advertisements, for fear (literally) that consumers will associate negative feelings with their brand. But, the opposite is true. Studies show that eliciting fear allows your brand to be seen as the one good thing in a dark world, meaning your consumers will lean on you more when things take a turn for the worse. Anger and passion make us stubborn … and stubbornness leads to viral content and loyal followers. Think about that Facebook video about a local tragedy or political issue that has tons of likes and thousands more comments. Like happiness, strong emotions like anger and passion inspire people to share content. Studies show that producing content that purposely elicits anger and anxiety will lead to virality and increased views. Now that you know why emotional marketing works, let’s talk about how you can incorporate it into your current efforts … or perhaps a new campaign. There are a variety of ways to market your business using emotion. The below strategies can be combined and used to evoke all kinds of emotion. We do encourage you to start with the first one, though, as what specific emotions you target will depend on who you’re marketing to. This is a crucial step before doing any kind of marketing, much less emotional marketing. If you don’t know your audience, how will you know what kind of content they’ll respond to best? How will you know which emotion to target to elicit the best, most valuable response for both them and you? Before deciding which emotion to weave into your marketing, conduct some serious target audience research. Like any marketing effort, you want to elicit an emotion that resonates with their pain points or general desires and dreams. Researching your audience will better inform your marketing decisions and save you precious time and resources. This might seem like a simple strategy, but it holds more influence than you think. Like I explained above, color and emotion are closely tied … in more ways than one. Color actually plays a major role in evoking emotion. Have you ever walked into a room and immediately (and inexplicably) felt some type of way? 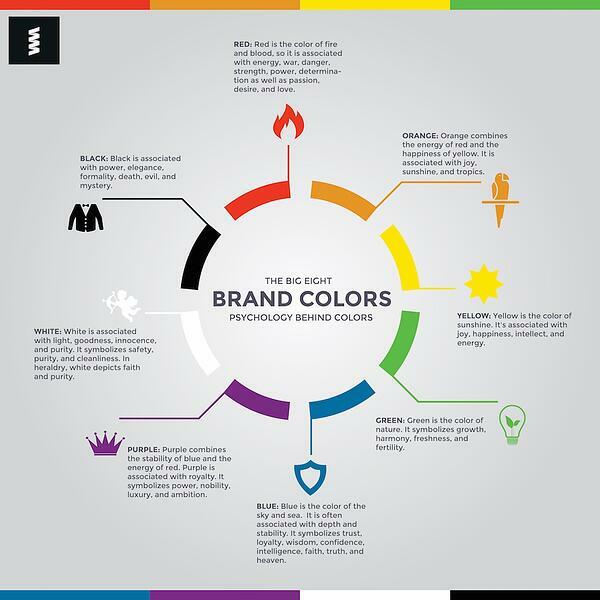 This is called color psychology, and a wide variety of businesses and organizations use it. Therapists paint their offices to calm their patients, football teams choose jersey colors that excite their players and audiences, and movie producers design the color scheme for posters and trailers that elicit feelings of fear or surprise. The same goes for brands. Consider the Coca-Cola red or Starbucks green. The color red evokes strong feelings such as love, excitement, and joy (as well as anger and warning). In the case of Coca-Cola, red portrays positive, friendly energy. On the other hand, the color green is often associated with harmony, balance, nature, growth, and health — all components of the Starbucks brand and “green” movement. Storytelling is a surefire way to connect with your audience. Whether through sadness, anger, passion, or excitement, stories are easily relatable and shareable, regardless of the makeup of your audience. Proctor & Gamble’s commercial titled “Thank You Mom” aired before the 2014 Sochi Winter Olympics. It features many famous Olympians and the stories of how their mothers supported them throughout their athletic careers. Since mothers are a large part of P&G’s target audience, the commercial is perfectly positioned to both tell a resonating story and market their products. Another heartwarming piece of emotional marketing is MetLife’s commercial “My Father is a Liar.” It chronicles the life of a young girl and her father, who’s attempting to get a better life to care for his family. The commercial closes with the tagline “A child’s future is worth every sacrifice,” which positions the ad to connect with MetLife’s target audience: parents and families who’d do anything to provide for their children. Using emotional marketing to establish a movement or community around your brand taps into a few different psychological triggers. The bandwagon effect it creates keeps people intrigued by what the crowd is doing. Also, feelings of camaraderie, acceptance, and excitement can create a sense of loyalty to your brand. TOMS does a great job of crafting this sense of community. When you purchase a pair of TOMS, you not only help someone in need, but you also join the TOMS community. You now belong. 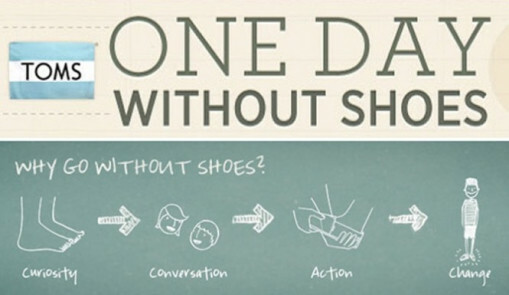 The marketers at TOMS enhance this community by promoting activities like “One Day Without Shoes” and encouraging their customers to use hashtags when sharing images. Aspiration isn’t quite an emotion, but the process of feeling inspired definitely brings out many emotions: elation, joy, excitement, hope … just to name a few. Aspirational campaigns are powerful because they tap into a dream, goal, or vision that your audience longs to reach. To successfully target aspiration as a marketing approach, businesses should understand how their product helps their consumers reach those lofty dreams and desires. Red Bull executes this approach well through their “Red Bull Gives You Wings” campaign. Their commercials feature intense moments where real athletes are achieving their goals and dreams. These ads also associate Red Bull with feelings of elation, excitement, and hope that, one day, you can reach your dreams, too. While some advertisements tap into how we’re currently feeling, others elicit emotions that we’d like to feel. That’s the goal behind projecting an ideal image through your marketing. Great marketing explains how a certain product or service can solve for a pressing problem. Great emotional marketing uses emotion to convince consumers that your product is not only the right solution, but that you can also feel great using it. Brands like Old Spice use the “ideal image” to their advantage when marketing their hygiene products. Their iconic “The Man Your Man Could Smell Like” uses humor to insinuate that you (or your man, ladies) could be as handsome, accomplished, and suave as the actor in the commercial … all by purchasing and using the Old Spice product. Emotional marketing should be measured just like any other marketing effort … except for you’re measuring the emotional response itself. If you’re curious as to how your audience is responding to your advertisements (outside of a clickthrough, subscription, or purchase), you might need to do a little manual analysis. To get a read on your audience reaction, consider running surveys or providing a space for feedback during your initial campaign launch. This open-ended, quantitative approach will leave room for honest, real-time audience reactions and give you ideas on where you can improve. Another method of manually analyzing audience feedback is holding a focus group. To learn more about market research, read our guide here. Another way to measure your audience’s emotional response to your marketing is to decipher how their emotions manifest as actions. As I referenced earlier, happiness typically leads to sharing, sadness leads to giving, fear leads to loyalty, and anger leads to virality. Depending on the emotion elicited through your marketing, you might expect to see a bump in activity surrounding one (or more than one) of these activities. For example, if you release a short promotional video that centers on happiness, joy, and excitement, keep an eye on how your social media followers respond. If they’re sharing the video with others, it’s likely doing its job putting a smile on someone’s face. On the other hand, a fear-centered approach might lead to greater email subscribers or social media follows as your audience establishes loyalty with your brand. Weaving emotion into your marketing and advertising is a surefire way to attract, resonate with, and encourage your audience to act. Think of emotional marketing as the secret weapon you never knew you had. To successfully put emotion in your marketing, all you need to do is know your audience and know which emotions would resonate most. Align these with your overall marketing goals, and your emotional marketing efforts will be some of your most effective.